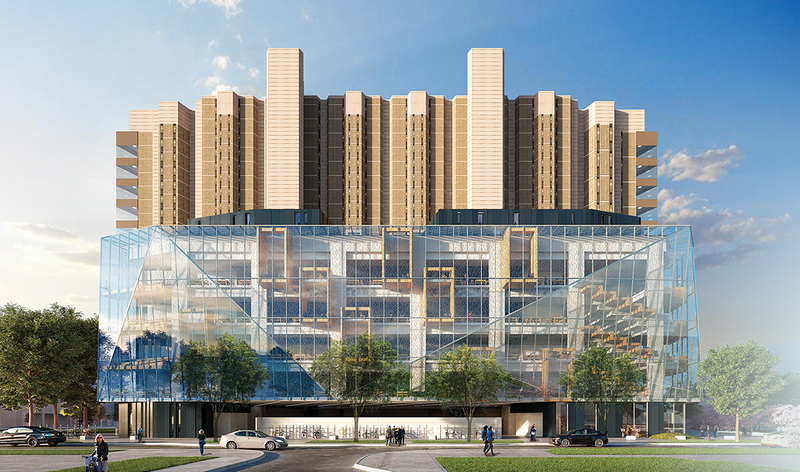 Robarts Common will make the University’s central library more inviting, accessible and productive for students. Robarts Common will be a new five-storey structure designed to enhance Robarts Library’s relationship to the campus, bring a flood of natural light to lower floors, and improve the overall environment and experience for U of T students. This capital project is a crucial component of the University’s long-term plans for an improved student experience—one that has been 50 years in the making. When the original blueprints for Robarts Library were drawn up in 1967, they included a third structure on the west side. But for a number of reasons, the University was never able to realize this full vision for its main downtown library—until now. Thanks to the generosity of Katherine Morrison and her husband, the late Russell Morrison, and hundreds of other donors, this final piece of Robarts Library, to be completed in 2020, will dramatically increase the quantity and quality of study spaces, and reconfigure them to support learning in a networked world. Robarts Common will add 1,222 new work spaces to Robarts, bringing the total number of student spaces to 6,027. These new spaces have been designed to reflect the social, collaborative and digital ways that today’s students use libraries. Some spaces have been designed for study and individual reflection, others for working on collaborative projects, still others for developing academic presentations. This addition, moreover, comes at a critical time. The number of daily visits to the library now tops 18,000 at peak times, and Robarts is a home-away-from-home for commuter students. In this regard, Robarts is much more than the flagship of U of T’s library system—it is an important hub of the St. George Campus. The construction of Robarts Common was made possible by a lead gift from Katherine Morrison and her husband, the late Russell Morrison—Canada’s strongest champions of student space—who previously supported the creation of 1,412 student spaces in the Morrison Pavilion at the Gerstein Library. The Morrisons also contributed to Morrison Hall, the University College residence on St. George Street.